Some of you (maybe most of you) are aware that I have a series of quilts made exclusively from second-hand items. I have bought almost all the items at these shops here in Poland. 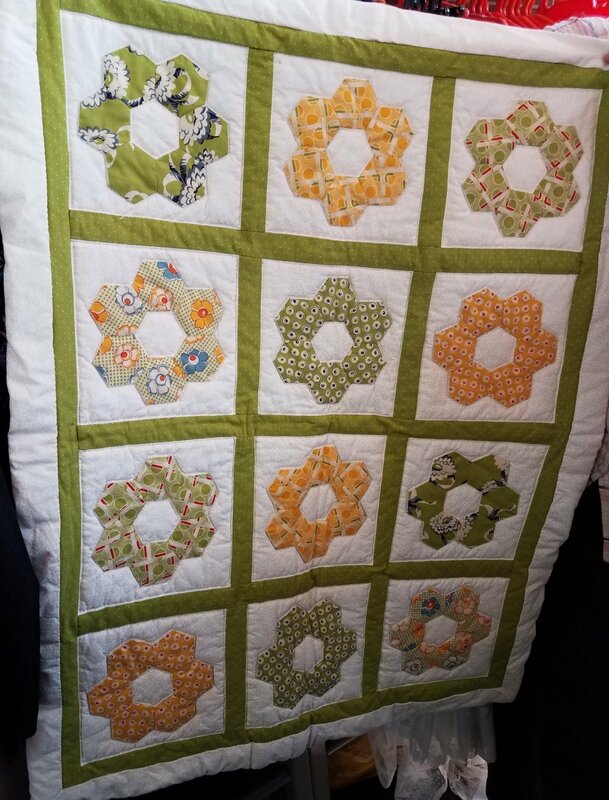 My challenge was/is to make some quilts that don't necessarily scream "I made this from second-hand shirts". I wanted to make sure that it could be done before I said it could be done. I think I've shown that in a pretty extensive blog post from earlier this year. What Are Second-Hand Shops Like In Poland? Here in our area of Poland we have a nice variety of second-hand shops. In the UK they tend to call them "charity shops". 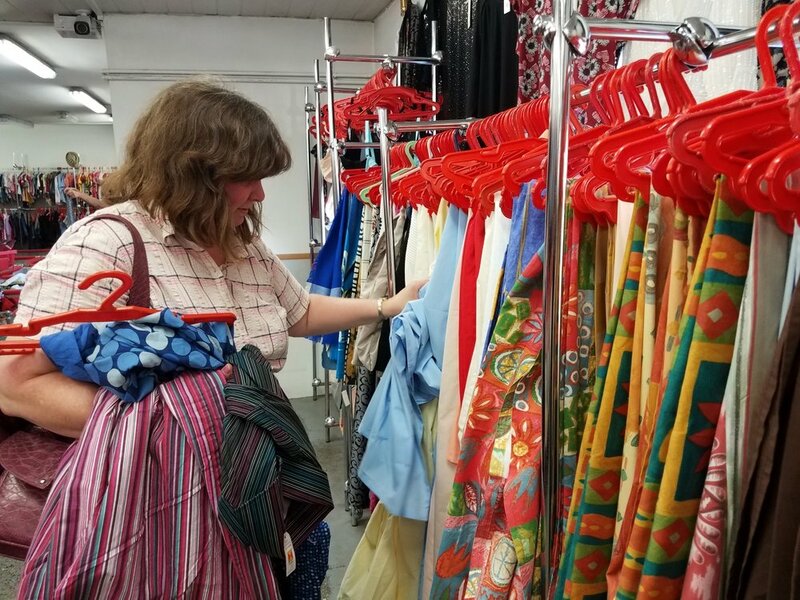 Most second-hand shops in the USA are also connected to a charity, though I suppose consignment shops aren't. This says "wholesale used clothing"
Anyway, these aren't charity shops here - they are for profit. 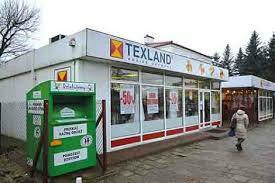 Anyway can go to a place like Texland wholesalers pictured above and below and buy a container's load of second hand clothing and sell them. You pay by the pound for them. Here are some containers opened up and ready for purchasing. 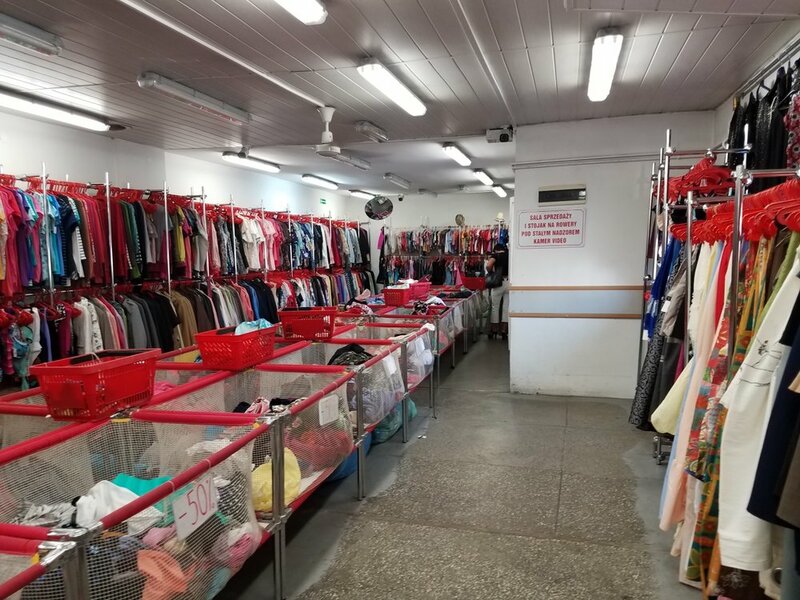 You do not 'pick and choose' when you buy wholesale - you buy a whole bag of unsorted clothing or bedding. I have bought here before, but after spending $100 and not really getting what I thought was a great deal for usage in quilts, I decided that my best bet is just buying from the local stores - not wholesale -where I have to take the undesirables (to me) along with the really great. Our most successful local shops are the ones connected to the aforementioned "Texland" which imports from northern and western Europe. My sis and I went to a couple of these shops one afternoon - we have three that all boast the name "Texland" - one is large and two are smaller. They are located close to our building in Otwock - (church building, that is). We stopped in one day on our way to or from there. Walking in the front door this is what you see. Here I am examining the second hand curtains and bedding. I picked up a shirt and three duvet covers. I think I paid about $15 for all of that. I found a shirt here for about $1. I wasn't really in the market for more second hand clothing, so I've not been going in here lately. Need to use a lot of what I have. 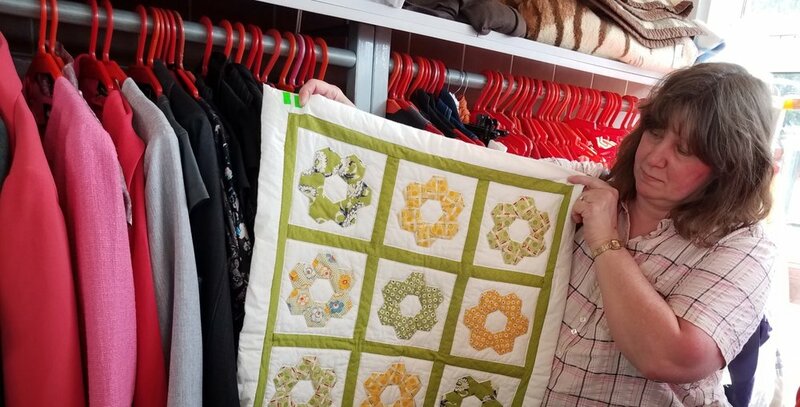 We went into another small one and found this cute little baby quilt - about $3. Since it was already quilted - we decided to leave it for someone else to discover and buy. If it had been an unfinished top, I would have executed a "rescue". What were the prices like? And now you've seen a tiny bit of two of our local second-hand shops. Neither of these had things for really, really cheap (like $.25) - but about $1 was the least expensvie item. I think the stores that had the weekly deals that went all the way to 1 zl ($.28-.30) went out of business. I didn't see how they could stay alive as rent here in Poland isn't particularly low! Enough of what we have here...if YOU need something for your current projects, make sure you check out what my sis has to offer. You can buy fabric by the piece and fabric by the yard! She's looking high and low for good deals to share with you! This heavy weight cotton fabric from Mill Creek Fabrics would make a beautiful chair seat covering or backing. The large swirls look contemporary. Background is cream with tan swirls. 45" wide. 3-5/12 yards of this unknown fiber content solid white is NOT 100% cotton. This would make a good lining or costume for a child's play. It's a non-stretchy fabric. 42" wide, 100% cotton, peach with peach flames throughout. Moda fabric. The picture here looks yellow, but it's definitely peach. 42" wide, 100% cotton. This beautiful piece of cotton has the initials db built into the design. Along with the initials in white, they have placed purple and gold flowers on a black background. 1-3/4 yards of this beautiful fabric is available for your designer bag or other purpose! Beautiful Pink Floral with Red flowers and green stems. Monochromatic in appeal because this is a cream with a black. Nearly 3 yards of this gorgeous cream with blue and purple berries. 2 yards, 34"
Pale Green background is not showing up very well. More pink than shown here. Superman logo on pink background. "Sold for noncommercial use home use only"
Closing in on the goal for 2017!